“Build a better mousetrap,” the old saying goes, “and the world will beat a path to your door.” Brew a better beer, however, and regulators will tie your door shut with red tape. Startups in the craft brewing industry face formidable barriers to entry in the form of federal, state, and local regulations. These barriers limit competition and innovation, reducing consumer welfare. While customers and new entrants are harmed, these regulations can be a privilege to incumbent firms and industries. There are various political and historical reasons for the persistence of these rules, despite the fact that they lack economic justification. Policymakers interested in economic development should eliminate regulations to help firms overcome confusing and unnecessary barriers to entry and to level the playing field between established firms and their newer, smaller rivals. All entrepreneurs face entry costs, regardless of the industry they seek to enter. Some of these costs are inherent to business, such as those related to developing a business plan, raising capital, and bringing the product to market. 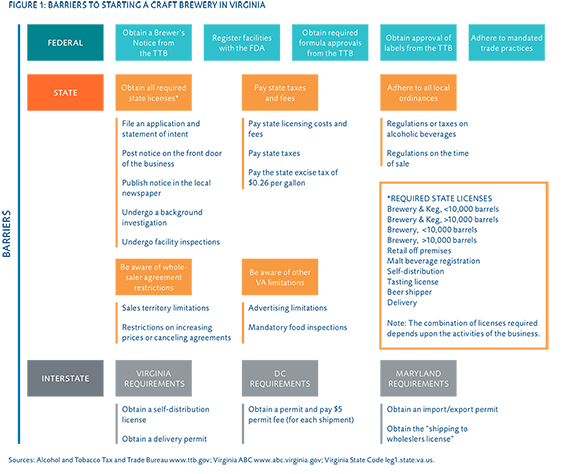 Other costs are the result of regulations that—while imposed on all firms—tend to be more burdensome for newer and smaller operators.1 A series of regulations increase the cost of developing, producing, and distributing new products in the brewing industry, including the “three-tier system” and an assortment of licensing and permitting laws. As figure 1 demonstrates, there are a number of federal and state permits and authorizations with which brewers must comply before they can bring their product to market. We find that an entrepreneur attempting to enter the brewing market in Virginia must complete at least five procedures at the federal level, five procedures at the state level, and—depending on the locality—multiple procedures at the local level. Before her first bottle can be sold, the brewer must also obtain approval for her beer label from the TTB and register that same label in states where she plans to sell it.11 Depending on her ingredients and brewing methods, she may also need approval from the TTB for her formula as well.12 Once she is in business, the brewer must ensure that her ingredients and brewing methods comply with regulations enforced by TTB, the Food and Drug Administration, and—in the case of organic beers—the US Department of Agriculture.13 In addition, how the brewer, wholesaler, and retailer market beer is subject to federal and state regulation.